since we have received our first shipment of CHALK PAINT® by Annie Sloan in English Yellow!!! 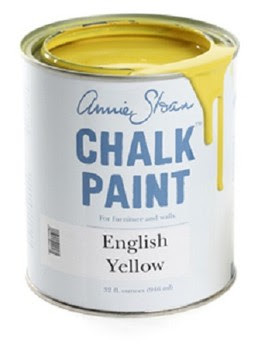 This is what Annie calls a "clean" or "non earthy yellow;" it blends beautifully with other colors. 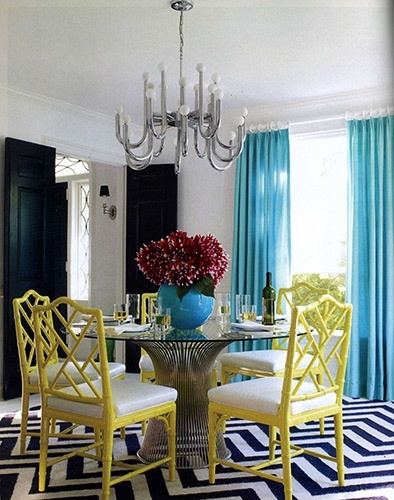 One of our favorite combinations is English Yellow and Antibes Green, which creates a perfect lime green shade. We've been painting everything in sight with this pretty pop of color, and we know you'll love it as well. 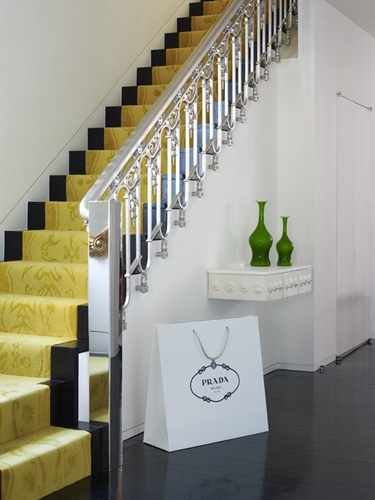 Be sure to come by and see for yourself! 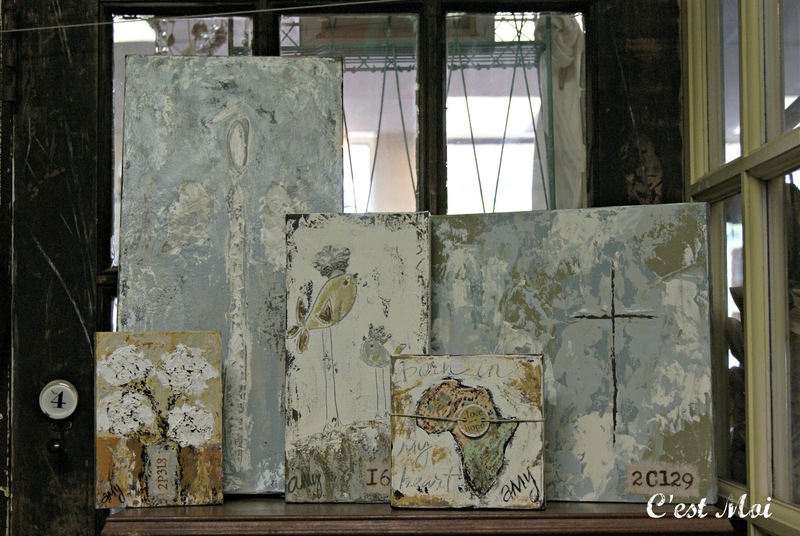 Amy Rankin, one of the newest artists to be featured at C'est Moi, is the owner and creative mind behind 2540 Designs. Inspired by the Bible verse Matthew 25:40, Amy and her husband adopted their daughter from China and have become supporters of several charitable organizations that promote and provide adoption services. Part of the proceeds from her sales go to these organizations. We admire Amy's desire to give back and serve others in need and are proud to promote her work. We also happen to love the color, texture, and inspiration her art work exhibits. 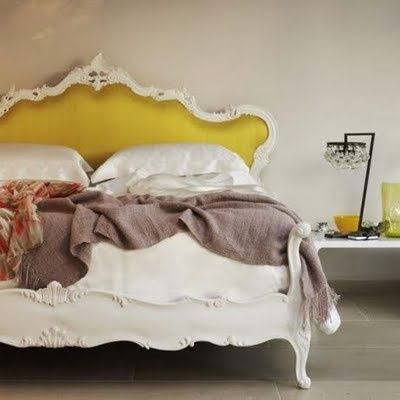 It's simply beautiful and would be gorgeous in any home! Sheryl Putnam is another local artist whose work has blessed the lives of others. Several years ago, through the midst of several trials, she began creating what she calls "prayer pockets." 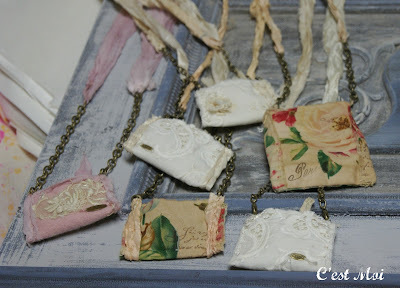 She hand stitches pouches from vintage fabrics and attaches antique chains to them to create necklaces. A small scroll of paper, tied with a ribbon, rests inside each one. You can write a prayer on the paper and keep it close to your heart, reminding you of it throughout the day. Sheryl's prayer pockets are a sweet gift for anyone struggling through a difficult time. 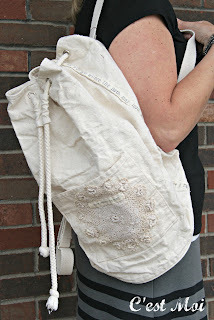 Sheryl also makes these canvas vintage embellished backpacks. Its design and size make it a versatile bag that can serve as a regular book-toting back pack, a purse, and everything in between. They're even more adorable in person, so make sure you come to C'est Moi and take a look! 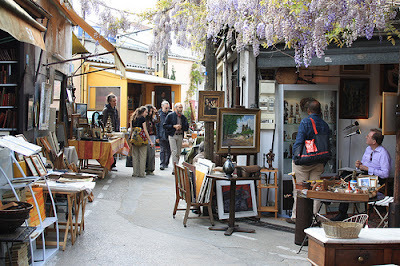 "Brocante" is the French word for flea market, and Paris is home to the most famous brocante of all: Les Puces ("The Fleas.") It covers 17 acres and receives between 120,000 and 180,000 visitors each weekend, making it the largest antique market in the world. Dealers and customers alike love to haggle over prices; negotiating is a hallmark of Les Puces, as well as other flea markets. But you don't have to travel to Paris to enjoy a brocante. 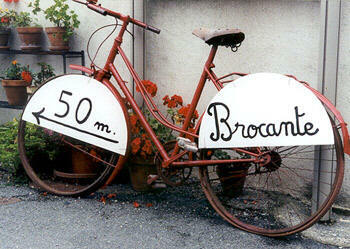 This Friday, June 15th, C'est Moi is bringing the brocante to Brentwood! A wide variety of items will be on sale, including rugs, bedding, furniture, and Waxing Poetic jewelry. Don't let the sale tag deter you from negotiating, though; the haggle is part of the fun!